Modulight launches the world’s first multi indication CE and ETL certified medical laser - Modulight, Inc. Modulight launches the world’s first multi indication CE and ETL certified medical laser - Modulight, Inc.
Tampere, January 28, 2015 – Modulight, Inc., a leading biomedical laser manufacturer announced today ML7710 laser platform launch and certification. Unlike other lasers in the industry Modulight ML7710 has been certified and supports a wide range of indications and configurations. Medical CE and ETL marking are valid for all multi-channel (1–8 outputs) laser configurations between 400–2000nm and up to 15W vs. typical application and wavelength specific support. 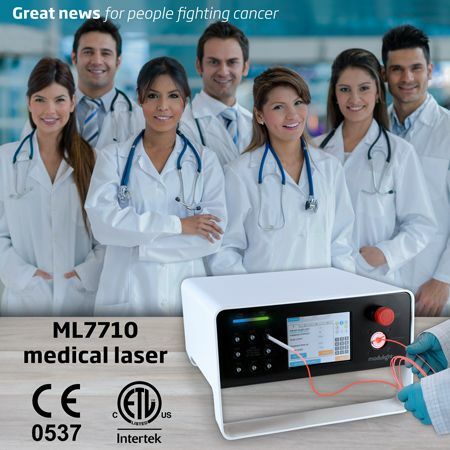 ML7710 supports directly several laser based treatment modalities, like photodynamic therapy (PDT), laser surgery, photo disinfection, and photo coagulation. This saves cost through reduced time to market for multiple indications as well as protects the hospital and clinical investment as the laser is probably the most versatile product available in the market. ML7710 is available also to large pharmaceutical companies that wish to brand the light source – yet simultaneously offer the best in class technology and enjoy quick time to market through complete product including regulatory documentation and lifecycle support. “We have managed to accumulate years of customer feedback and requirements to a solid, easy to use product. I am not surprised that so many companies and leading oncology research institutes in Europe and North America have adopted our product and many patients have already received quality treatments with ML7710. Because of the unique multi-channel design I expect this product to be found in many new applications by the end of the year”, says Sampsa Kuusiluoma, Manager New Product Introduction. Modulight has shipped tens of ML7710s in the pre-market phase to a number of customers and we are now accelerating the deliveries world-wide. Currently our customers are curing following tumors /indications: bile duct cancer, skin cancers and diseases, ENT (ear-nose-throat) cancer, neck & head cancer, lung cancer, and others. Many of these are discussed next week in our PDT workshop in San Francisco.